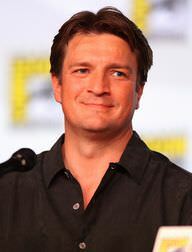 Nathan Fillion at the 2012 Comic-Con in San Diego. Nathan Fillion is an actor who became a household name for his role as Richard Castle in the television series Castle, as well as for his role as Captain Malcolm Reynold in the television series Firefly. Some of his popular film credits include Slither, Trucker and Waitress. His first major acting role happened in 1994 in New York when he played the role of Joey Buchanan in the soap opera One Life to Live. He left the series in 1997 and moved to Los Angeles to further his acting career. He is the son of former English teachers Cookie and Bob Fillion. He has an older brother named Jeff. He was romantically linked to his Castle co-star Stana Katic. He became deaf in his left ear in 1977. Nathan Fillion is a famous Canadian actor, who was born on March 27, 1971. As a person born on this date, Nathan Fillion is listed in our database as the 6th most popular celebrity for the day (March 27) and the 17th most popular for the year (1971). People born on March 27 fall under the Zodiac sign of Aries, the Ram. Nathan Fillion is the 91st most popular Aries. Aside from information specific to Nathan Fillion's birthday, Nathan Fillion is the 21st most famous Canadian and ranks 15th in famous people born in Edmonton, Alberta, Canada. In general, Nathan Fillion ranks as the 904th most popular famous person, and the 191st most popular actor of all time. “The Famous Birthdays” catalogs over 25,000 famous people, everyone from actors to singers to scientists to serial killers and more. If you're curious to see who was born on your birthday, you can use our database to find out who, what, where, when and why. You can search by birthday, birthplace, claim to fame or any other information by typing in the search box, or simply browse our site by selecting the month, the day, the horoscope, or any other clickable option.